Sub: Recruitment against Scouts & Guides quota - procedure for. 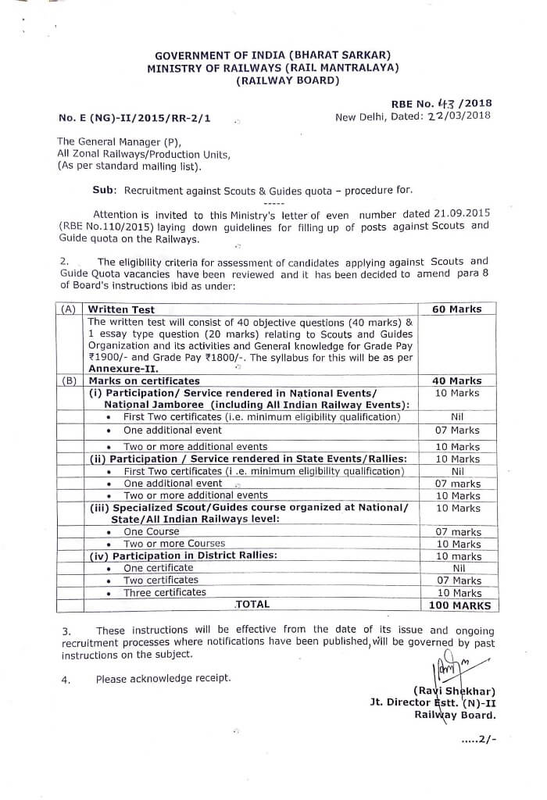 Attention is invited to this Ministry's letter of even number dated 21.09.2015 (RBE No.110/2015) laying down guidelines for filling up of posts against Scouts and Guide quota on the Railways. The written test will consist of 40 objective questions (40 marks) 1 essay type question (20 marks) relating to Scouts and Guides Organization and its activities and General knowledge for Grade Pay ₹1900/- and Grade Pay ₹1800/-. The syllabus for this will be as per Annexure-II. 3. These instructions will be effective from the date of its issue and ongoing recruitment processes where notifications have been published, will be governed by past instructions on the subject.